Tash & Noah: Freedom speech at city court from Climate Collective on Vimeo. 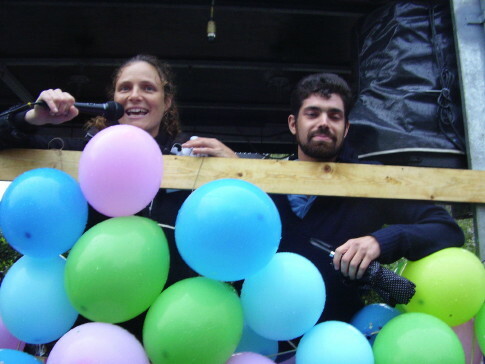 The court has found climate activists Noah Weiss and Natasha Verco from Climate Collective in Copenhagen innocent to all charges made by the state prosecutor. Among the charges was incitement to violence against police and disturbing the public order. 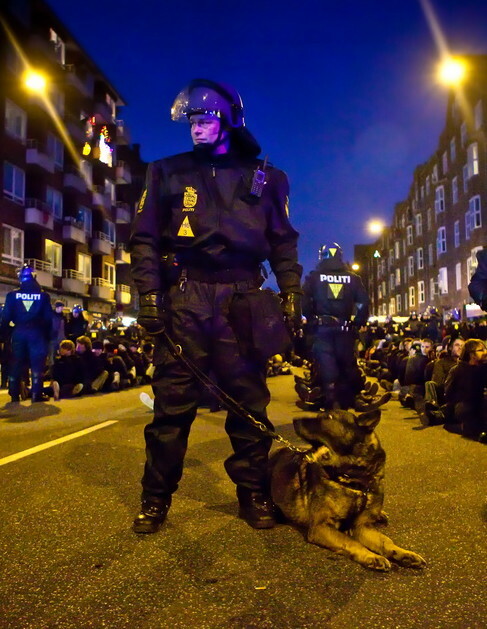 Both were arrested in connection with protests during COP 15 in Copenhagen, at different dates that were not linked to the demonstrations. Trials have been a tragicomedy. The two were initially accused of guilt for almost all actions taken during the Climate Conference. This after the same pattern causing ten-double penalties for protests at the EU summit in Gothenburg 2001, where all the accused were considered to have collective guilt to all riots that motivated extra heavy penalties. In Denmark, however, some of the most extreme unreasonable charges of terrorism against the accused were dropped early in the process but the accused were anyway faced with the possibility of long prison terms according to the new Danish law against civil disobedience. The trials reached one of its tragicomical highlights when the prosecutor pointed out that one of the notebooks seized from one of the accused contained a notice of a bolt cutter. He took this as an evidence of planning violent action in connection with protests against the policies that create climate refugees by lack of fair and effective action against global warming. After the prosecutor’s accusation members of the audience brought the bolt cutter to the court room. 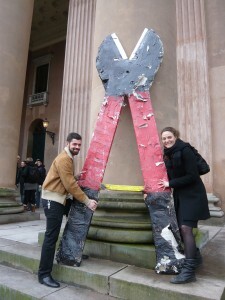 It was three meters long and consisted of papier-mâché and is used in symbolic protests against the refugee policies. The trials of the two accused and other preventive arrested or detained during the climate summit, have lined up many similar desperate attempts to prove activists guilt and police innocence. This was also for long the view in the media during the summit but it did not hold in the court. Denmark did not repeat the decay in a judicial system after a summit in the way it was done in Sweden after Gothenburg in 2001. The wind has turned, and the threat of 12 years in prison, hundreds of thousands of Danish crowns in fines and expulsion from the country where the two accused have their daily lives have been turned to the acquittal on all charges. Long live the Danish judiciary’s rejection of the police worldview and freedom! The historical mass arrest of 918 innocent demonstrators on December 12 without collective efforts by the Danish organizers to act in solidarity with their invited marchers. The Danish courts are now doing what the Danish representative organizations afraid of their reputation in mass media did not do: find the accusations against the non-violent activists and demonstrators invalid. The Copenhagen City Court has today ruled that Natasha Verco and Noah Weiss are innocent. 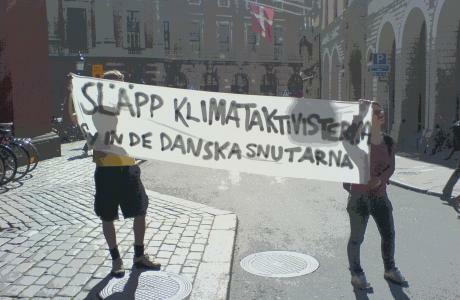 The two climate activists were charged for organizing illegal activities during the COP15 summit in Copenhagen in 2009. But the charges didn’t stand in court. The verdict discredits the violent methods adopted by police during the climate summit, when politically active people were denied their democratic right to criticize the climate negotiations. There has been a very clear political purpose behind these court cases, and the verdict is totally absurd. In the whole case the evidence has been related to fully legal activities, that the police has tried to manipulate, in order to make them appear illegal. It has been all from prints of posters, to finding parking lots fors sound equipments and participating in open information meetings for hundreds of people. I see this as a victory, not only for us, but for the legal rights in Denmark. And it also means that no longer can the police use manipulation of evidence and lies to repress politically active people. I assume that also Tannie and Stine, who are going to court in October, will be acquitted as well, says Noah Weiss. 2000 people have been arrested during the climate summit in December, and many were preventively arrested during the big climate demonstration on December 12th, 2009. These incidents, has later been criticized, among others, by Amnesty International. Now there are four people charged for having, according to police, planned actions during the summit. Among them are Natasha Verco, 32 years old Australian woman, and the American student Noah Weiss. “AN AUSTRALIAN arrested and held for nearly three weeks for organising a protest against the Copenhagen climate change conference has been charged with offences commonly used in terrorism cases. Natasha Verco and others on Australians’ relationship with the physical environment.